To design a wall clock and packaging design for an existing brand while keeping the company’s heritage, identity and character intact and prominent. For this assignment, we were asked to choose an existing retail brand, and then design a wall clock and it’s packaging accordingly. We were to collaborate with product design vendors and laser cutters in order to create an actual working mock-up of the clock. I decided to choose "Fossil" as my brand. 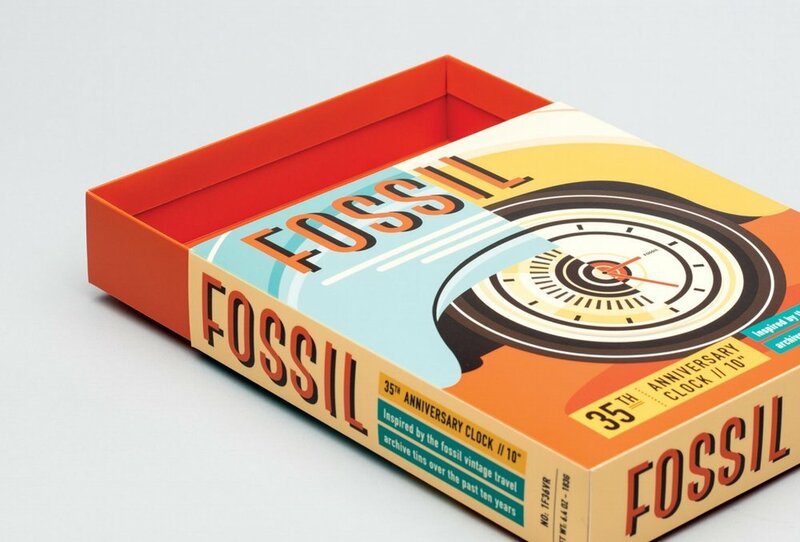 As a part of my brief, inspired by colourful product tins of the 1940’s and 50’s, Fossil set out to create a vintage product that people would want to keep forever and treasure. This limited edition clock would express the iconic and vintage heritage of the brand. The colors & graphics of the packaging depict this theme, and the clock accents the persona of the iconic vehicle design and graphic styles of that era.